Now as you look up at Cygnus the Swan you can't help but notice a really bright star nearby that's almost straight up. That star is the renowned Vega, the home of the aliens in the movie Contact. Vega is a zero magnitude star, about the same (apparent) brightness as Arcturus. It is actually 25 light years away, nearly twice as far as Altair, 3 times the mass of the sun, and about 50 times as bright as the sun. Imagine having 50 suns in our sky. If Vega was our sun we'd be cooked. So you have now been introduced to all three stars of the Summer Triangle: Vega, Altair, and Deneb. See the triangle? Learning to recognize this can be a good way to orient yourself in the sky, especially early in the evening when the stars are first coming out. The star next to Vega to the northeast (or up and to the left), e (epsilon) Lyrae, is actually a double star when you look at it in binoculars. However, if we can get a good telescope on that star you will see that each of the stars in the double is itself a double - a very cool sight to see. These four stars form a set that is a true double-double star, formed from the same nebula, which was spinning so fast it first spun apart into two protostars. They in turn each spun themselves apart into two stars. The parallelogram star to the southwest, the lower right-hand corner of the lyre, is b (beta) Lyrae, which is another variable star - it is usually about as bright as the southeast, or lower left-hand corner star g (gamma) Lyrae. Every 6½ days the star dims to half its brightness. This star is an "eclipsing binary" - two stars orbiting each other every 13 days. So every half orbit one of the stars passes in front of the other and instead of seeing two stars we only see one - the star drops to half its brightness, which is about a magnitude. This is different from a Cepheid variable, where the star itself is changing. So take a look at b Lyrae - do you think it's eclipsing right now? 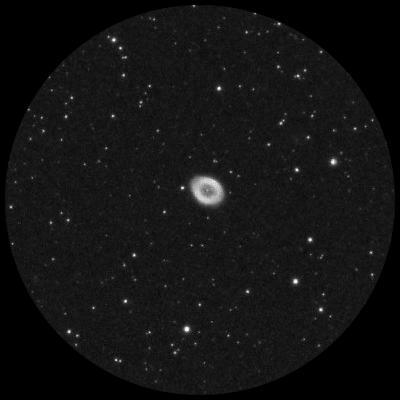 Now if we can get a telescope aimed right about half way between g and b Lyrae (a little closer to b) and look in the eyepiece, you'll notice something a little funny - it doesn't look like a star at all, it looks more like a - smoke ring maybe. 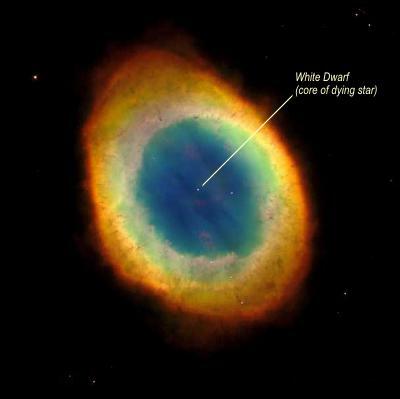 This is the famous Ring Nebula - another planetary nebula - a shell of gas blown off by a dying star, and lit up by the radiation from the exposed core of the star, now a "white dwarf".